Hey kids, vote for crazy granma !!! "Pelosi says she backs lowering voting age to 16 "
Apparently demRATs need more than just the overwhelming support of imaginary people. I’m all for it. :0. Lowering the voting age to 16 would do for democrats what raising the voting age to 35 or 40 would do for republicans. With no real world experience and huge college debt looming, free college and health care sounds wonderful. Then after 20 years of paying into the system and seeing how wasteful it all really is you move to the right and become much more conservative. Better lower the age in which child support payments end too. Here in NY they go to age 21...so we have “children” voting for three years. and end “child” support payments to mommykins on their behalf. and mom should not be receiving child support until they turn 21...the way it is in most BLUE states...even 24. What I find bothersome is no one brought it up before you did and that it’s treated like lowering the voting age can and will be done by Pelosi. Close to 150 replies and I believe we are the only two even aware this is a Constitutional issue. The demographic shifts they need for a permanent Dem majority aren’t happening quickly enough, and they are losing some of the intended Dem voters here and there. Does she want to lower the drinking age to 16? Driving age? We could go back to that system. I'd be OK with the franchise going only to net taxpayers. Let those who pay have the say. Yes, that is curious. I wonder if anyone in Congress is asking the question. From the example of 1970, the law passed and Nixon signed it, even though he doubted it was constitutional. He turned out to be correct. The extension of the franchise to women —also via constitutional amendment. 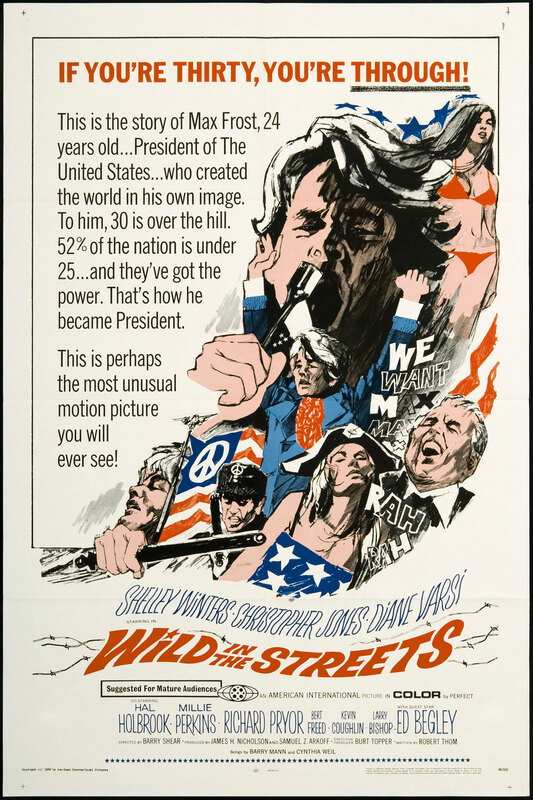 An old 1968 movie some may remember called ‘Wild in the streets’ was a surreal future where a drugged out band leader became president. He had a mantra to lower voting age to 15. “15 or fight.” The young rulers that took over had ‘Old’ folks over 30 forced into camps and fed LSD. This is how far the desperate dems have come. Just inches from an actual sci-fi movie. It was kind of cool for it’s time. Had a young Richard Pryor as drummer. 1970 was different than to day in that the emotional logic ( know that’s an oxymoron) was if we could send 18 yo kids off to war, they should be able to vote. From that perspective, it does make sense. Today’s reasoning for 16 year olds is purely to get brainwashed kids to vote demonrat. They do not have the maturity to have the slightest clue what they are being tricked into. Kids have a herd mentality, where if one jumps off a cliff because it’s cool, most of the others will too. Any kid that does not follow the herd is shunned. Ya lose ONE presidential election and you want to throw out electoral college and lower the voting age. Take a breathe and try to come up with a better candidate next time. From what I’ve read, they discussed lowering the age to 18 for about thirty years before actually getting it done. People of that age had some other rights and responsibilities of adulthood, so they did have some foundation for the change. But someone who is sixteen has none of those, and for good reason. Pelosi gushes about how enthusiastic they are. They do have enthusiasms, but I don’t think they have the right kind. And they are manipulable, which is what she is hoping for. I think it's really important to capture kids when they're in high school. . . .
"and she should know--she's captured quite a few." Who knew? If fetuses could vote the democrats would quickly become pro life. Or possibly the Dems will pass some kind of bill that upon birth, the mother can vote not only for herself but the baby as well.